Medici In Vino Veritas Wine Carafe - Glass w/Pewter - 28 Oz. 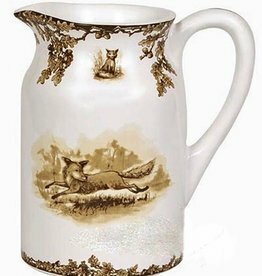 Beautifully hand painted pitcher depicting a bucholic scene. 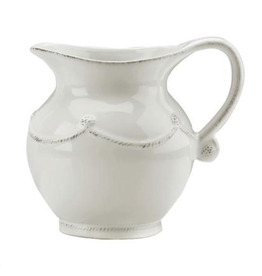 Classic lines make this pitcher a favorite for any table. Etched with a monogram this glass pitcher makes the perfect wedding or hostess gift. Dimensions: 10” Tall with base 5” diameter. 60 Oz. Capacity. 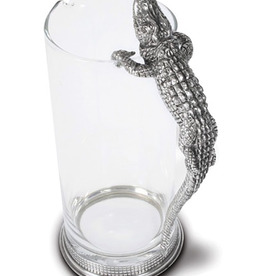 Perfect pitcher for everyday use on your bar, outdoor entertaining, or pitcher. Generously sized - 8.6" h. Holds 96 oz. Tart lemonade on a summer's day. Fresh-brewed tea awash in ice. The sweet promise of Vermont's maple syrup. The Meriden Pitcher in three sizes. Mix and match to your heart's delight. 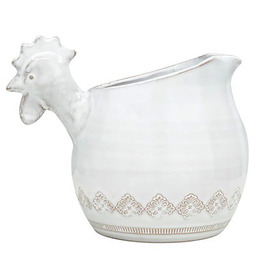 Berry and Thread Small Pitcher - Whitewash - 7"H - 1.5 Qt. From Juliska’s Graham Collection- Crowned with a simple thread and single berry, dressed in optic glass from the waist down and belted with a charming sash this large pitcher is a supreme vessel for iced tea, sparkling water or pink lemonade. Unbelievable handcrafted piece for everyday beauty. The Addison is at home as the focal point of a formal dinner-party, yet versatile enough for everyday use. The Ascutney Carafe is both practical and inspiring. Create a strong visual statement by filling it with red wine. 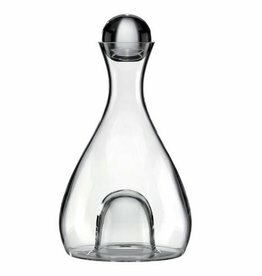 The decanter’s wide base allows for better aeration and enhances the wine’s flavor. The Woodbury Carafe extends this iconic line in the bar and on your table. This square contemporary design is ideal for water, sangria or flowers. This soft shape with its solid round stopper and graceful, sloping shoulders is like a figure drawing. A rich, tawny liquid might fill the warm, clear, generous glass. 10X5.5X5.5"
Bring the outdoorsy elegance of an equestrian lifestyle to your table with Vagabond House's unique Equestrian D Ring Bit carafe. We have a gift for tradition, reimagined, in our String of Pearls collection. Pearls form the handle of this elegantly handcrafted Small Bar Pitcher made from 100% recycled aluminum. With its straight lines this pitcher have a clean style that makes it one of our best-loved pitchers. Durable and timeless, it’s an everyday staple. Woodbury Pitcher - Large - 64 Oz.